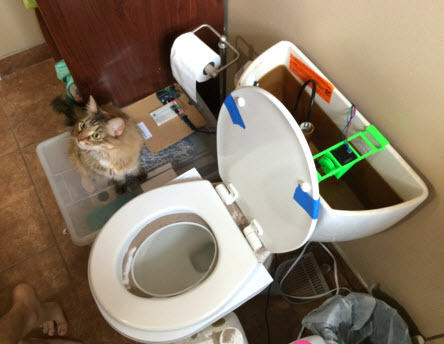 Be sure the toilet is flushed regularly for your cat to use it! Measure your toilet tank. Make a 3D printout of the flusher to hang on the tank and hold the motor, or create one out of wood or by gluing pieces of plastic together. Attach a stepper motor on the flusher and wire the motor to an Arduino. Cut a piece of fishing line, tie a fishing weight in the center of the line, and tie one end of the fishing line to the chain on the toilet tank plug. Attach the other end of the fishing line around the motor wheel. Program the Arduino to activate the motor several times per day, and train your cat to go to the bathroom in the toilet.